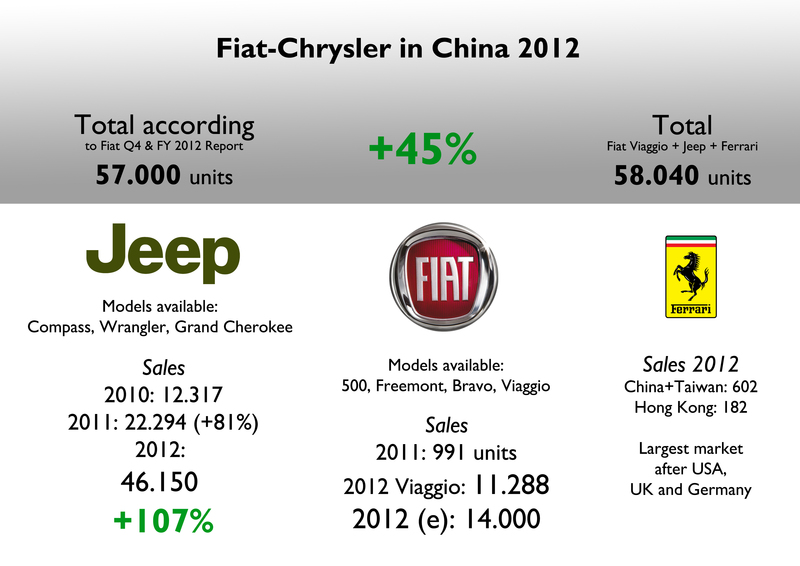 Last year Fiat-Chrysler sold around 57.000 units in China, up a massive 45%*. This is a very good result if total market is not considered: China is world’s largest car market and Fiat-Chrysler is one of the last car makers to arrive. Of course is always good to have that growth rate, but is also quite normal to jump like that when you’re really small and you’re starting business in a market that doesn’t stop to grow. Nevertheless is important to mention that in 2012 China became the group’s 11th largest market ahead of many other European countries. It shows how big and important this market is for any car maker in the world. Unfortunately the group’s growth is overshadowed when it comes to market share: 0,39% in Passenger car market. That’s lower than most of market shares of the group around the world, and is even behind Russia’s (0,47%) and Iceland’s (0,61%). It means two things: there is still a long, very long way to go in China, and a lot of work must be done quickly to gain some awareness among Chinese people. Chinese market is extremely big in terms of volume and offer. The analysis by segment includes only the locally produced passenger cars (around 90%) as is very hard to get information for imported cars. According to Best Selling Cars blog, last year more the new car passenger market slowed down its growth to 14.682.215 units, up 6%. There is information for 90% of that quantity. 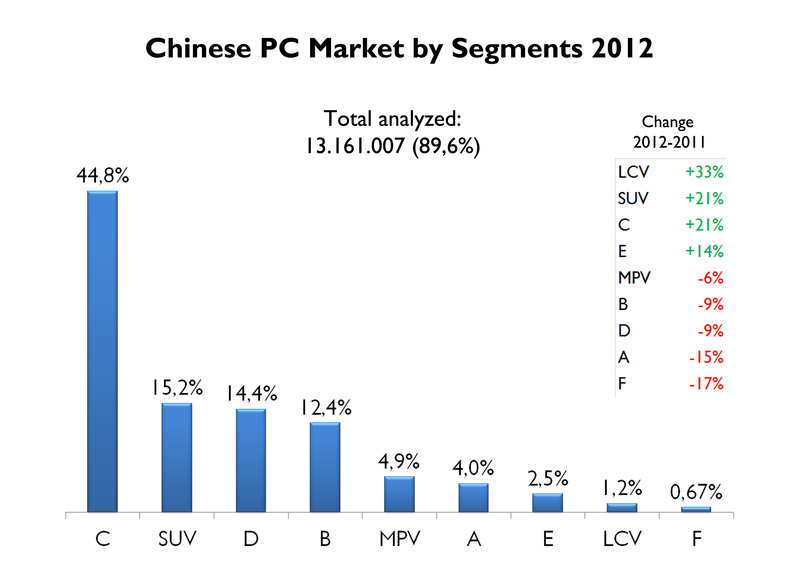 Chinese car market continues to be strong in C-Segment, which counted for almost 45% of total*. This segment includes the sedans and hatchbacks between 4,3 and 4,7 meter long. There are plenty of options there, from the basic Chinese brands to the luxury Germans. It is the segment where almost all brands are present and is the base of the success of giants like VW and GM. It is also the segment that had the biggest jump in terms of share. 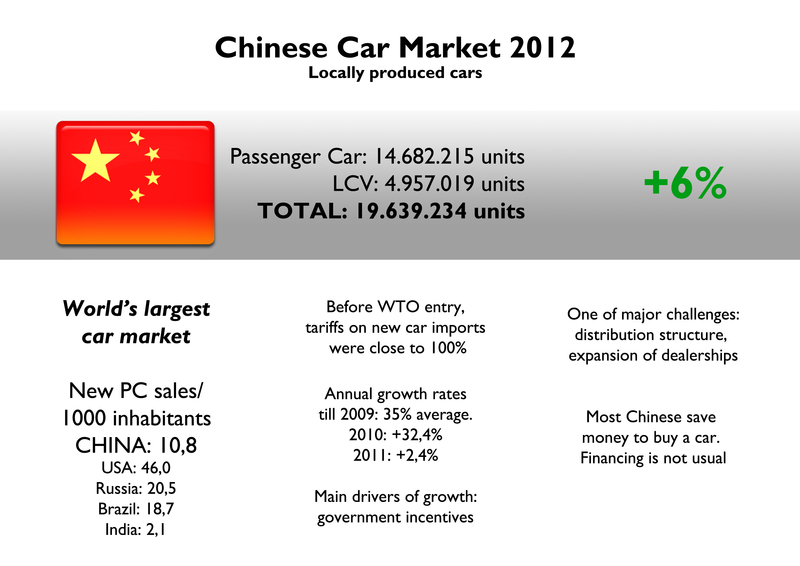 It means Chinese consumers continue to prefer this kind of cars (taxis are part of this success too). However, in terms of change, D-SUV was the segment with the highest growth. The middle size SUVs now count for 4% of total sales and 28% of total SUV registrations. All types of SUV gained 1,7 basis points, which means that they are up a massive 21%. 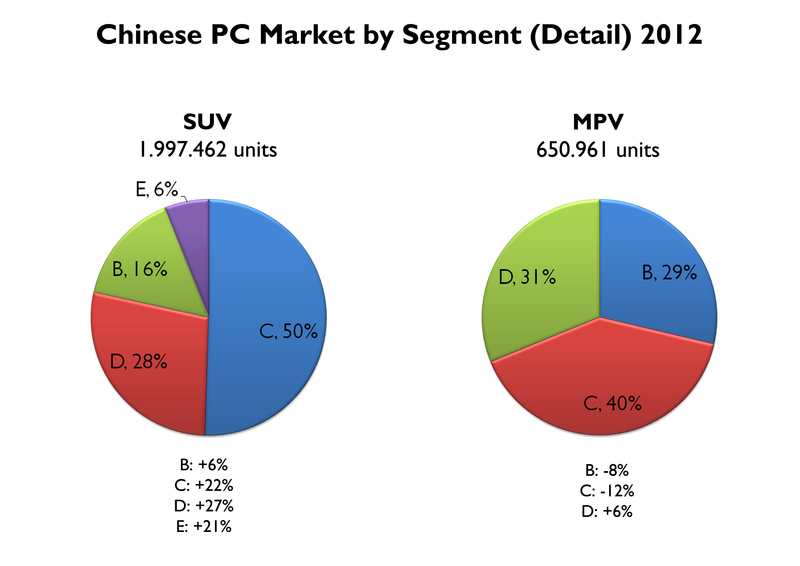 In other words, Chinese continue to love compact sedans and begin to look at SUVs. 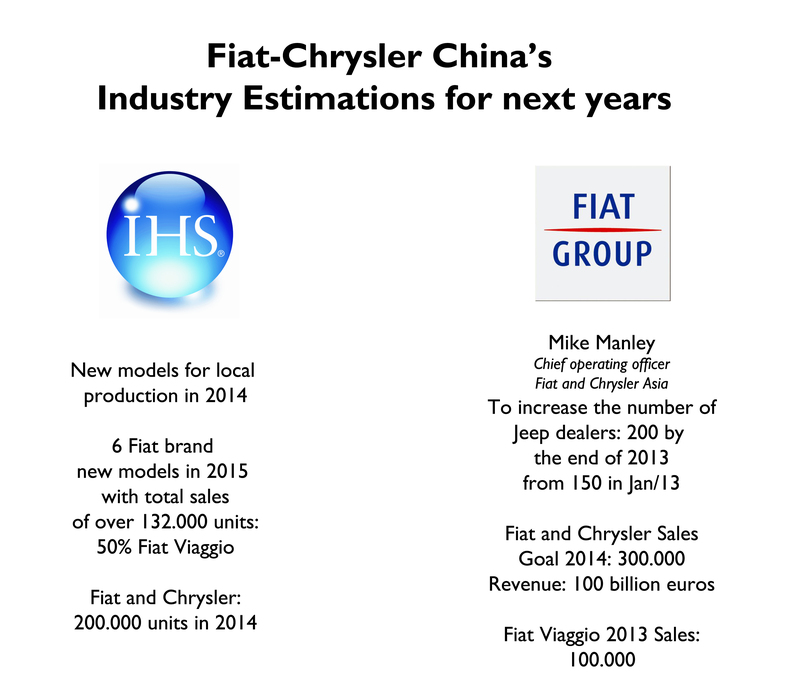 Regarding Fiat-Chrysler, I found few information. Fiat brand finally began local production of its all-new Viaggio for the C-Segment, which had a good start but didn’t meet Fiat’s target of 15.000 units by the end of 2012. Fiat sold a bit more than 11.000 units of this model, which means that it got 0,2% of its segment. According to Fiat-GAC (the Chinese partner) the Viaggio boosted other models sales (500, Freemont, Bravo). Nevertheless, there is no official data for these models. I could also find information for Jeep, which is the best-selling brand of the group in China. The brand sold a bit more than 46.000 units, up a massive 107%*. 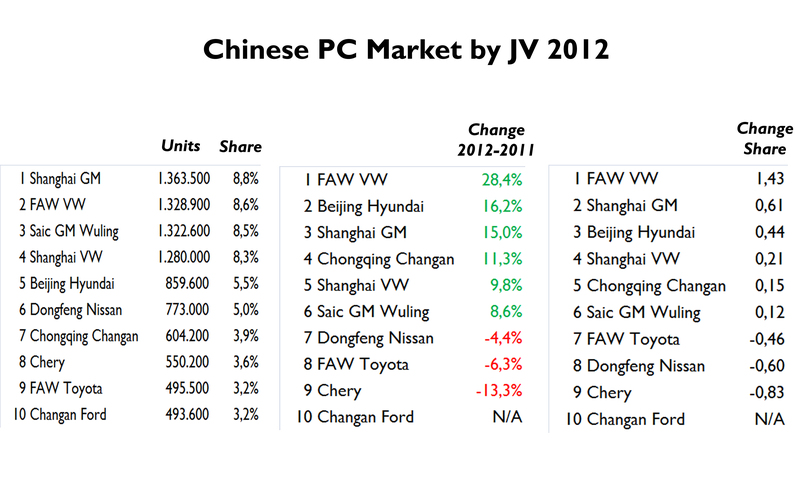 This result is even more impressive considering the fact that Jeep doesn’t produce its SUVs in China. That’s why Fiat-Chrysler is looking forward to start local production with its partner GAC. Taking into account SUV segment growth and Jeep registrations, it is not hard to determine that the group’s future in China is closely related to this brand. 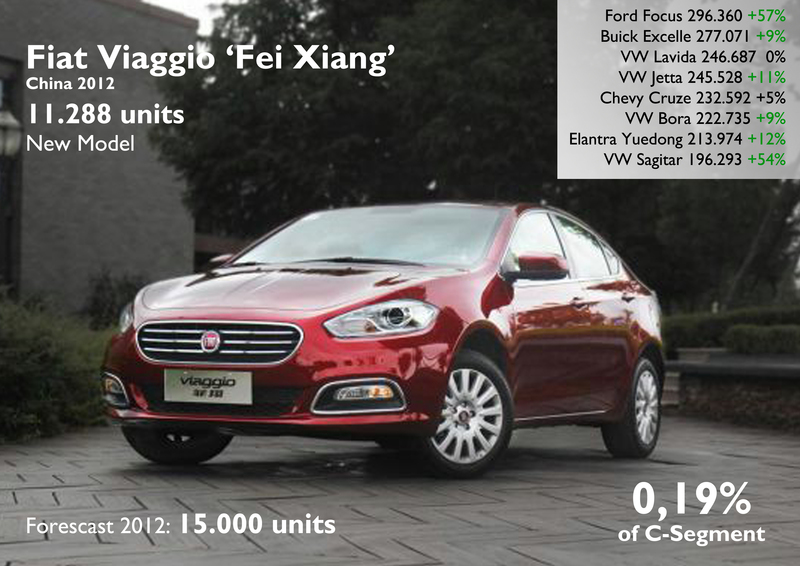 According to Fiat-Chrysler ‘Q4 & FY 2012 Results Review’, the group sold 57.000 units in China in 2012, which is the total of Fiat Viaggio + Jeep brand sales. 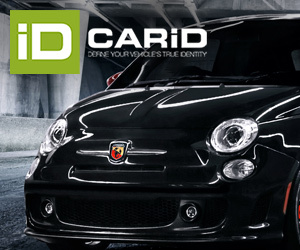 It means that other Fiat models and Chrysler brand figures wouldn’t be included. Ferrari sold 602 units (Taiwan included). What’s next? big expectations come from the Fiat Viaggio. The group wants to sell around 100.000 Viaggios in 2013 according to former GAC-Fiat general manager, Jack Cheng. The first 2 months of 2013 show that the target may be exaggerated as Fiat struggles to have more presence with its dealerships (around 150). As it happened with the small 500 in USA and its first months in that market, Fiat must change the strategy in China if it wants to sell more. February figures are extremely bad and competition gets more difficult. In November 2012 IHS, the global information company, estimated that Fiat will sell 132.000 units in 2015 with 6 locally made models and the Viaggio counting for 50%. This forecast is far from Fiat-Chrysler estimates. Jeep should help the group as local production should start this or next year. Big plans for a big market. The problem is time and I think they are not going as fast as they should. ** Total doesn’t include imported vehicles, regular LCV, Sport and pickups. how is possible that the Viaggio sell so little in this early 2013? Good question. I’m sure Fiat-GAC is doing something to solve this problem. However it is my belief that the low brand awareness and the lack of dealerships (150 at the moment) may be part of it. By point of comparison … I just saw that Volkswagen is targeting to have 3000 dealers in China. Hope that Viaggio can achieve what she deserves. Positioning the 500 will be the critical sucess factor in the Chinese market(forget the A, B C segment). Do you have any information on How well the Viaggio is selling now, in China? Success? Thank you! It is not selling good. I will publish a post about it.